Losing a beloved cat is devastating. While there are commonalities in how we mourn, grief is a very individual experience, and no two people will deal with pet loss in exactly the same way. But there are some things that can help ease the pain of loss. Finding ways to memorialize a cat who has passed on can be an important part of the healing process. This can take many different forms. One of the things I’ve always done after losing one of my cats is surround myself with photos. I would place them all over my house. In some small way, it made me feel like the lost cat was still with me in a somewhat tangible way. You can also create a physical collage suitable for framing, or an online photo album. Going through years of photos may bring tears, but hopefully, it will also bring smiles as you remember your time together. Plant a tree, a rosebush, or a flowering plant in your cat’s memory. Doing something life giving is a wonderful way to remember a cat, and you can visit with your memorial plant whenever you feel you need to be close to your cat. After Feebee passed away, a friend surprised me with a painted portrait. To this day, it’s one of my most treasured possessions. Write down all your favorite memories of your cat. You may think you’re not going to forget, but time has a way of blurring memories. Writing things down while they’re still fresh in your mind preserves these special moments. Feebee died twelve years ago, and whenever I go back to read what I wrote shortly after he passed away, it brings back memories of things he used to do that I had long forgotten. Sponsor a shelter cat in your cat’s memory. Donate to the group you adopated your cat from. Some shelters will even provide a memorial stone or plaque with your cat’s name. If you enjoy a particular kind of arts and crafts, consider creating a project in your cat’s memory. When Virginia, my first office cat at the animal hospital died, the entire hospital staff spent an evening creating mosaic memory stones. We made one for Virginia, and three more for other hospital cats who had gone before her. We placed the stones in the hospital’s front garden. Working on the stones together as we shared memories of the cats was a wonderful healing experience for everyone. Gather some of your cat’s favorite toys and display them in a pretty basked in a spot that was meaningful to your cat. Find a special urn for your cat’s ashes. I have all my departed cats’ ashes on the dresser in my bedroom. There something very comforting to me to see them just before I go to bed each night, and when I first wake up each morning. Ultimately, the best memorial is the one that has the most meaning for you. What brings you comfort when it comes to remembering a lost cat? 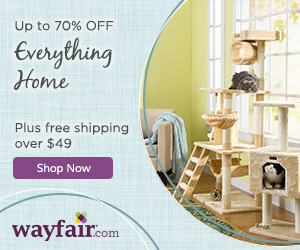 « Does your home have a cat superhighway? This is my memorial to Stormy. Thank you for letting me post it. She is safe in my heart and my heart will go on. Two and a half years ago a stray showed up lost and alone on my door step and quietly walked into my apartment and my life. It was a magical moment and love at first sight. She was the sweetest, gentlest cat ever, yet her playfulness made me smile. We only spent such a short time together, but, oh, the joy of the time we shared will always be in my heart. Little did I know when I named her Stormy, she was FIV positive, and we would indeed face the storm. She was a playful, sweet and a wonderful companion, and when she became ill, it broke my heart to see the essence of her begin to change. Stormy gave me hope again when I had lost all hope, then a secondary disease from the virus ravaged her. I did this dance with the devil providing treatment for as long as I could hoping that you would return to your former self. During the weeks we fought the disease, Stormy would hide in the corner of the room, but I will never forget the last night together as we lay down to sleep she came up to me, face to face, and looked into my eyes, then lay down close to my heart to snuggle. We stayed that way through the night. Stormy so bravely told me goodbye that night, little did I know she would be gone the very same time the next night. She knew. True Love comes in many forms. For me it was the form of a little, lost, black cat that walked into my home and into my heart. Stormy, taught me to cherish love in any form and appreciate the magic of the time you have together for you never know how much time you have in the presence of pure love. She taught me to make every moment count. What a lovely tribute, Donna – I have tears in my eyes after reading it. These heart cats like Stormy change our lives in a big way, don’t they? When Lancelot was run over I had him cremated. I’ve brought him with me to my new house and he’s in the lounge with a personalised frame saying “I hunt, therefore I am”. I’ve also got a Lancelot plant in my new garden which should be beautiful once its grown. He’s never forgotten. He’s still adored! Those are lovely ways to memorialize Lancelot, Sarah. I FOUND THIS SITE BY ACCIDENT , BUT AM GLAD I DID. I LOVED READING ALL YOUR FABULOUS IDEAS ABOUT MEMORIALIZING OUR FRIENDS. RECENTLY , I LOST MY BOY OF 11 YEARS . I’M A GROWN MAN IN MY 50’S AND I DO NOT THINK I HAVE CRIED MORE AFTER LOSING HIM AS AT ANY OTHER TIME IN MY LIFE. I AM SINGLE AND HAVE LIMITED SOCIAL NETWORK AND OR FRIENDS AND FAMILY THAT COME AROUND AND HE WAS MY FAMILY, FRIEND AND CONSTANT COMPANION. I OWE HIM THE WORLD. HIS NAME WAS CHAD AND HE WAS A BEAUTIFUL BLACK AND WHITE DOMESTICATED SHORTHAIRED CAT. HE WAS EVERYTHING TO ME AND PUTTING HIM DOWN 3 DAYS AGO HAS ABOUT DONE ME IN. I THINK I WANT TO UNDERTAKE A PROJECT AND DO SOMETHING IN HIS NAME. I HAVE TONS OF PICTURES ALSO I WOULD LIKE TO DO SOMETHING WITH. THANKS FOR HAVING ME AND FOR SHARING ALL YOUR BRILLIANT IDEAS. I DO NOT FEEL SO ALONE. THANK YOU. I’m so sorry about Chad, Jayme. Losing these special cats is so devastating – my heart goes out to you. When I lost Steeler on April 30, I was devastated. The memories in the house were everywhere. I have hundreds of photos of her as many of you know. She was so very special. I have her remains in a little cherry box and her hair is in where the picture is of her. I thought of ways that would keep her forever in my mind and heart. I decided on a portrait of Steeler looking up at me with all the love and trust in her eyes any one would die for. The portrait is currently being done by Bernadette Kazamarski, expect animal artist, photographer and writer. This portrait will forever be on a piece of furniture or on a wall. No matter where I am she will always be with me. The tears for her still flow easily, but with the love she gave like so many other little ones, tears will always come. The portrait will be a wonderful treasure, Bernie. I read this post and all the comments when they were first posted, with small tears in my eyes. All those are such beautiful ways to remember a furry friend. Today I read everything again, but the tears were much bigger. We lost our beloved Grouik on Saturday. Although my husband’s (Grouik’s human) pain as well as mine can only ease a little, but I know now that it will never go away completely, your post and all the comments gave me wonderful ideas on how to honor our late furry family member and friend. So thank you very much to all of you. Oh Carine, I’m so sorry about your loss. My heart goes out to you and your husband. I’m glad that this post, and the comments, helped ease your pain at least a little. Thank you, Ingrid and Ronnie. I’m so glad my site, and Buckley’s Story, were such a help to you, Ronnie. It means so much to hear this. So many beautiful ideas! Like Caren, I also keep a little fur from the critters who have left my life. My former husband celebrated a milestone birthday this year, and I wanted to give him a gift that would represent something special from our 20 years together. He always said it was because of me that he was introduced to the magic of cats. I met with a woman who made a “dreamcather” in Michael’s favorite colors, and then wove the kitties fur into the web. That gift blessed us both as we sat together in what had been a favorite “meeting place” and remembered the kitties who had shared our life. What a wonderful gift to your former husband, Chris. Your book “For Every Cat an Angel” is one of my ways of remembering Virginia, the office cat who came before Buckley. The day after she died, my former boss at the animal hospital gave me your book, and inscribed it “Don’t worry about Virginia. She’s with me. Love, Feebee.” Feebee was my first cat. The book has been on display one one of my end tables in my living room since Virginia died in 2002. Ingrid, I’m honored by your beautiful words – thank you very much. I’m so glad FeeBee found a way to let you know Virginia was among friends, and you didn’t have to worry about her. What wonderful ways you’ve found to remember My Kitty, Ronnie! Thank you for sharing all these special ways to memorialize a lost cat. I have several tributes for Rafiki, whose death in May 2011 was extremely traumatic for me. In our hallway is a large framed photo memorial and I also have a shelf in the living room with his urn and several angels and “Rafiki the monkey” (from Lion King) figurines. I also have a cat ornament that has his name on it hanging up and a beautiful painted pendant with his face on it that my mom had made for me after he died. I have poems that I wrote and some that were given to me from friends and a photo tribute to him on my facebook page as well. He is never far from my thoughts or from my sight, and he is never out of my heart. I, too, have the stipulation that when I die I wish to have my ashes mixed with my babies. I have often said that Rafiki is my feline soulmate. My “familiar”. He got me through the darkest times in my life and I want to make sure we are together for all eternity. What wonderful tributes to Rafiki’s memory, Chris! And I don’t doubt that he was looking out for you when he sent you his look-alike. I´m so very sorry Ingrid. I’ve posted your story on the blog (http://listagatos.wordpress.com) because I felt it so beautiful, touching and very sensitive. Even put the source link visible first the text. But do not worry. I’m pulling your story of blog. Oh, Marilia – I didn’t realize that was you! You’re welcome to run an excerpt of the story and link back to the full story! I’m honored that you liked it so much. We found a hard plastic green patina-ish cat with angel wings in a local housewares store. We of course purchased it. It had a small hole in the bottom that we used to fill with sand, then we plugged it up. Then with craft paint and some stencils we put Cianan’s name and when he was with us on it in a gold color. We then sprayed it with a sealant, and put it out back with some flowers, even though he was an indoor cat. We also had a custom Christmas ornament made with one of our favorite images and a lot of PhotoShop work on my part. Since he died early one morning before we went to work we clipped some of his hair and found some of his shed whiskers in the house and put them in a sealed container, so that we would always have a little piece of him. We miss our boy. The angel statue sounds like a lovely memorial to Cianan, D.D. I, too, have Christmas ornaments with my departed cats’ pictures. They bring tears each year when I take them out of their box, but they also bring wonderful memories of our time together. Jenny, that’s beautiful! I, too, have a clause in my will that when I die, I want my ashes comingled with the ashes of all the cats who have gone before me. That’s exactly what I want – I need to add it to my will though. My boyfriend asked me an interesting question yesterday – he said, “If you die before Charlie and Trigg, would you want me to wait to comingle your ashes until they die?” I really didn’t know the answer to that one – thoughts? I want my ashes comingled and then I want to be set free somewhere – either in the wind in New Mexico or in the ocean. Good question. My answer would be yes. Long story that I won’t get into, but because of my faith, we don’t cremate. So each of my precious babies have been buried at the cemetery at Wayside Waifs. It’s a comfort to be able to go out there and sit by their headstone before I volunteer. It’s also rewarding to know that, in the lean years for Wayside, sometimes it was only the meager revenues they brought in from the cemetery that allowed them to continue to keep their doors open and save the lives of other cats by adopting them out. I love the idea that the cemetery makes it possible to save the lives of other cats, Lisa. That’s a lovely memorial all by itself, in addition to giving you a place to go to remember them. It must be comforting to have all your pets buried in one place, Jessica. I went and bought numerous frames that had dividers for multiple photos and framed all of my favorites (they are now in my office and I am can look at them as I am typing this). Aww, Caren, your comment made me cry. I love that you have so many visual reminders of Bobo around your house. The inscription on his urn is beautiful. Many wonderful ways to honor the memory of a beloved cat. For me the most meaningful way is to save a life by taking in a cat in need. That is, indeed, a wonderful way to honor the memory of a beloved cat, Terri. I bought each a wooden shadow box put their picture, their collar and tags, and paw print from the vet in it. I used scrap book paper for a background, and the date I got each with the date they left me. They are displayed in my sewing room, a room we all spent a lot of time in. What a wonderful idea, Debra! That’s so sad about your rosebush, Vicki! These are all great suggestions. It’s so important to do something for closure. Ritual is healing. When Coco died I wanted to make a grave marker but didn’t want something like the ones at a pet cemetery near me. I chose large favorite rock I’d brought from Canada, wired a Maneko Neko cat figurine around it and wrote her name and dates in gold marker. What a lovely memorial for Coco, Layla! Awww all these ideas are so nice! Thanks! I have my Brandy’s picture in a beautiful frame, a little statue of a Siamese cat with angel wings, a round clay thing with her paw print impression that they gave me on the day that she died, along with her ashes in a small round wooden box that has paw prints etched on top and Brandy’s name and dates on the bottom with a ribbon wrapped around it – all these things sit together on a book shelf in my dining room. Oh and also – kinda creepy, I know – years before she passed away she had 2 teeth extracted and the vet gave them to me in a little jar (I worked in a dental clinic – teeth were fascinating); I have this little jar sitting with all her stuff. 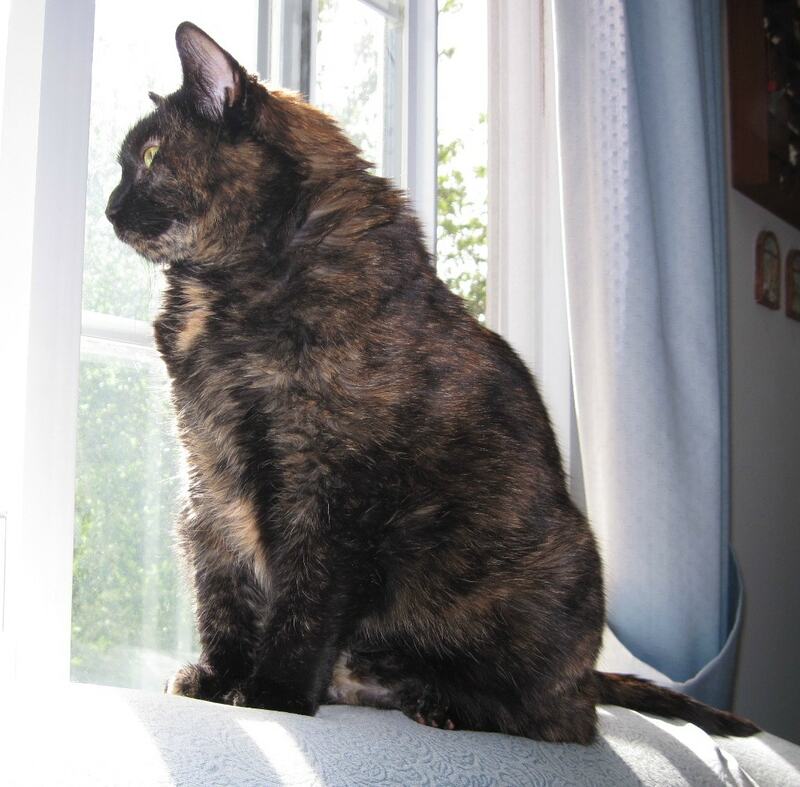 I had that silly cat for 10 years – loved her to death. I still have her sister who is now 15. I don’t think it’s creepy at all that you’re keeping Brandy’s teeth with all the other mementoes of her, Jessy.